"Meaty portabellos are topped with blue cheese. Great as an appetizer, or build a burger with crusty rolls, red onion slices, lettuce and tomato. I chopped the mushroom stems, sauteed them, and added them to the hamburger patties we barbecued. Yum, yum!" Place mushroom caps, tops facing down, on a baking sheet. Drizzle balsamic vinegar on each cap and sprinkle black pepper over vinegar. Bake in the preheated oven until tender and fragrant, about 25 minutes. Sprinkle blue cheese, pine nuts, and garlic on each cap. Continue roasting until cheese melts, about 10 minutes more. 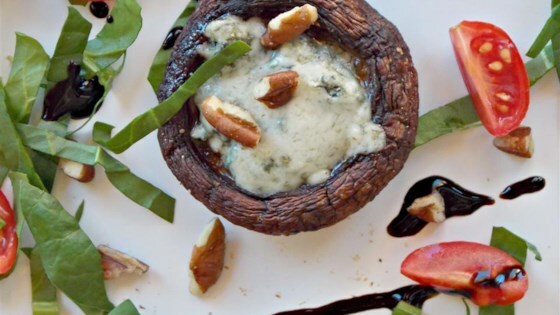 Watch how to make delicious grilled portobello mushrooms with blue cheese.